Ostensibly, artillery shells were supposed to be recycled, but their use as an artistic material kept their reuse for war efforts minimal. The scale of the Great War flabbergasted many when the true scope of the conflict revealed itself to the belligerents. Across Europe, the Old World powers mustered their populations for war in numbers never before conceived by man. What the leaders hoped would be a quick skirmish dragged on into a long, brutal conflict that shook the world. Entire generations of men fought as whole neighborhoods succumbed to poison gas, machine guns, and senseless forays into No Man’s Land. As the assembled forces of Europe dug in for what proved to be a devastating and brutally long conflict, they found themselves facing one of the truest adages of war. Namely, long stretches of boredom punctuated by moments of sheer terror. Hunkered down in bunkers and trenches as the war dragged on, soldiers came up with various ways to occupy themselves. When not ducking from artillery, going over the top, or killing rats, soldiers whiled away the time making things. 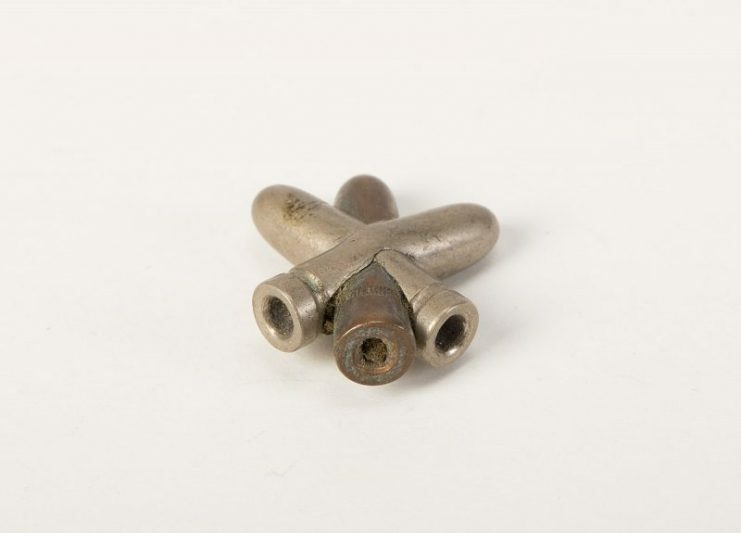 With a variety of handy supplies available, soldiers would usually work on spent shell casings and old helmets, turning these materials into various pieces of art of varying quality and design. Cannon shell converted to use as a vase. Bullets became crosses and letter openers. Shell cases could become ashtrays, sculptures, and vases, which tended to be the most common. Ostensibly, artillery shells were supposed to be recycled, but their use as an artistic material kept their reuse for war efforts minimal. 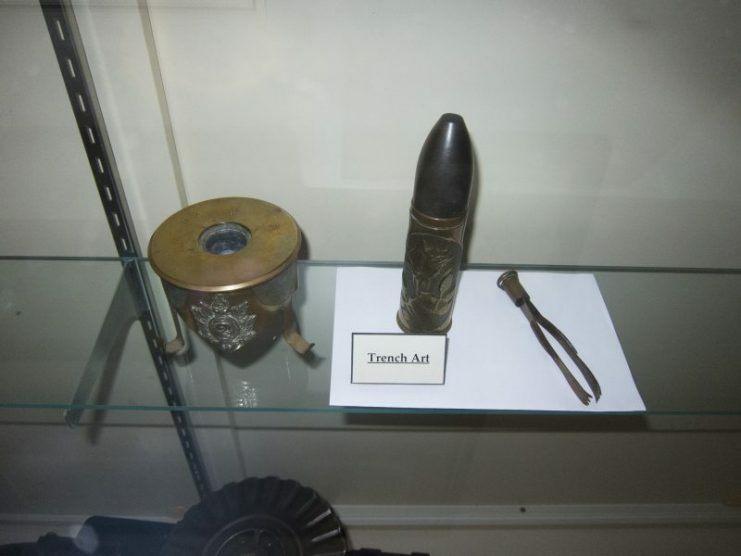 Depending on the theater of war, civilians also made trench art. Though varying wildly in quality, some pieces could be very intricate and beautiful works of art. 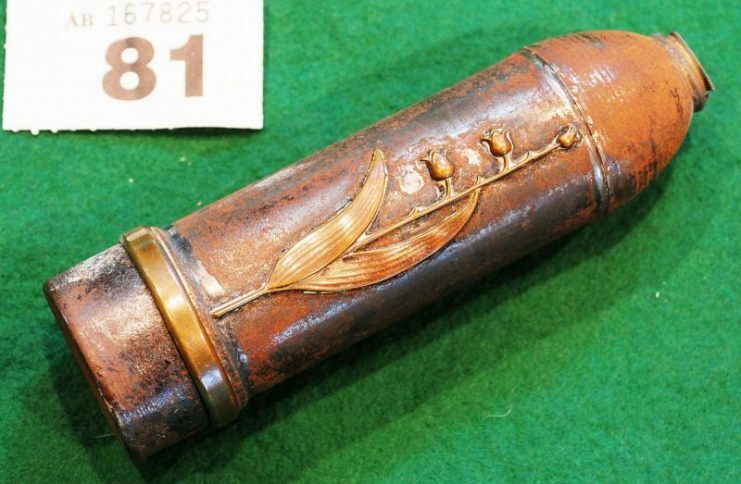 Some civilians utilized their artistic talents to sell trench art as souvenirs. 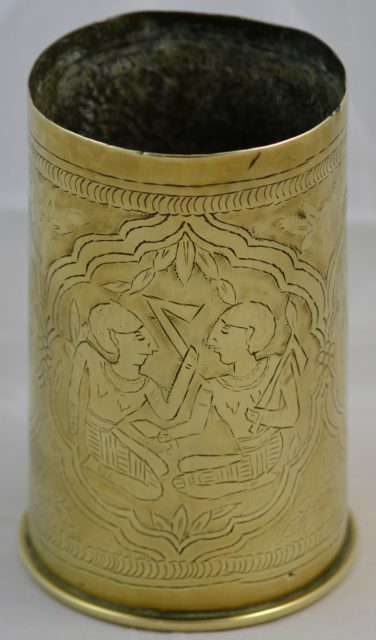 German shell case engraved with Egyptian figures obtained as a souvenir by Private Charles Horne who initially served in the Irish Fusiliers and later transferred to the Jewish Legion, the 38th Battalion of the Royal Fusiliers. Such forms of trench art would carry on into several wars, as people worked to scrape a living however they could in war-torn lands. Scavenging battlefields for materials formed another way for those in war-torn lands could scrape a living amongst the ruins. 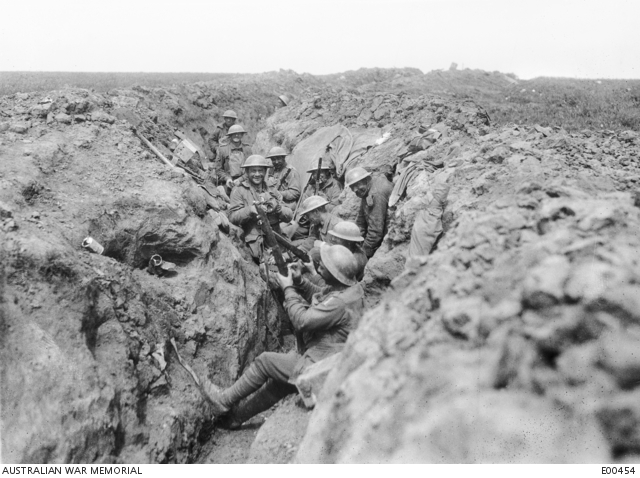 Australians in the second line of the trenches before Riencourt (near Bullecourt), in May 1917, cleaning their rifles in readiness for an attack. 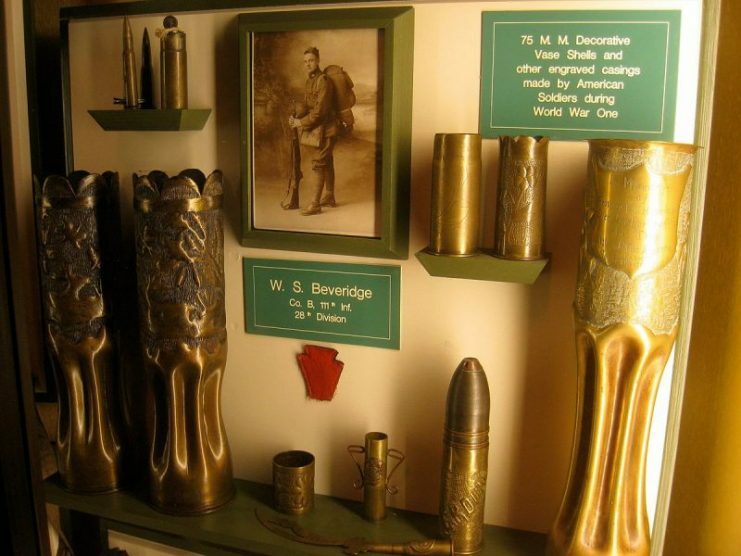 During the Great War, however, the soldiers in the trenches produced the bulk of the trench art, thus defining the term. Such works often consisted of roughly shaped, cut, or formed sculptures or trinkets. Some pieces of trench art, however, could become truly beautiful pieces, their origin all the more tragic due to their source material. 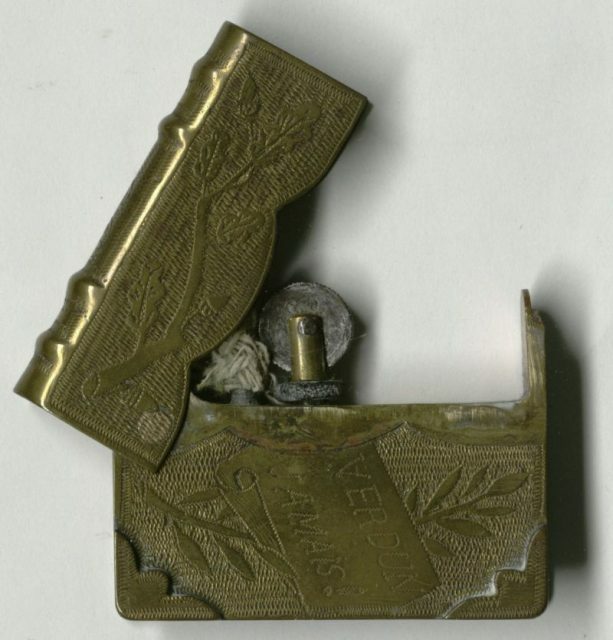 Objects of unknown origin made during the Great War in German trenches or prison camps. 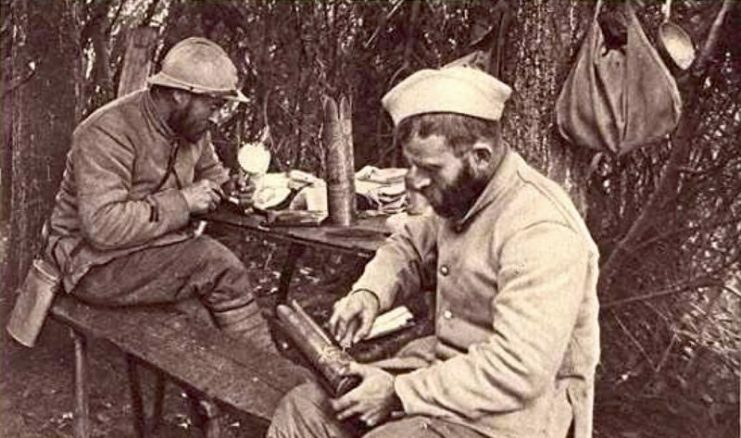 Carefully engraved tobacco jars, cleverly cobbled lighters, elegantly forged rings, even drinking mugs as decoratively functional as the tankards of warriors of old came to life under the bored and dedicated hands of soldiers across the trenches. 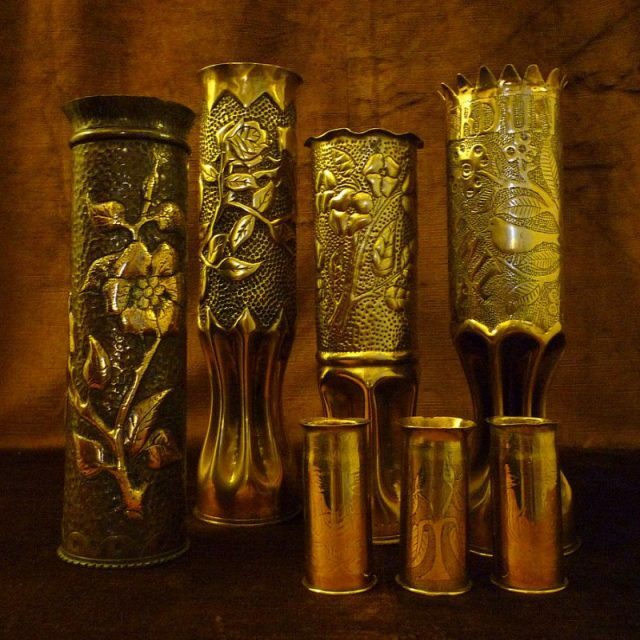 Whether decorative or functional, crude or gorgeous, simple or intricate, trench art told a story of boredom, creativity, and, above all, humanity. Stuck in a war of empires with nothing to do but to wait for their chance to get hurled into yet another seemingly meaningless battle, soldiers desperately grasped at anything to take their minds off the war raging around them. The opportunity to create something when forced into an event as destructive as war no doubt proved therapeutic. 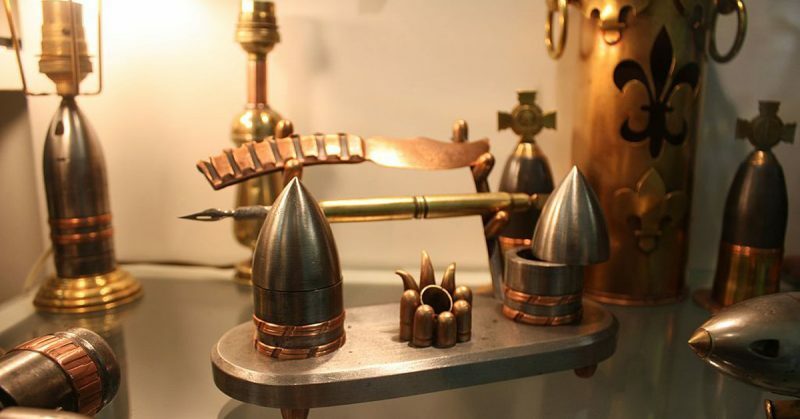 Turning bullets into crosses and shells into drinking mugs made the tools of war less lethal in their minds. In a war that defined the term “shell shock,” the ability for soldiers to lessen the horrors about them allowed them to retain some of their sanity and humanity. Weapons meant to kill and maim their fellow men were reshaped into works of art to render them unusable in combat. Decades later, this trench art remains to remind of us of the sacrifice, both in body, mind, and spirit of the men who created it. The soldiers themselves often took the artwork home, to remind them of their service and, hopefully, ease the transition back into civilian life.